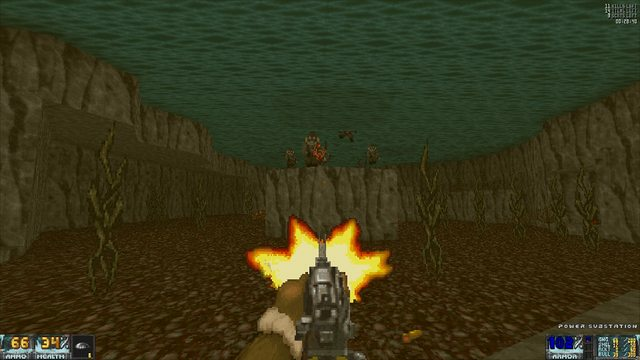 Operation Sea Wolf is a total conversion for Doom 2 and GZDoom engine. Being a total conversion means that it replaces all levels, weapons, and enemies. 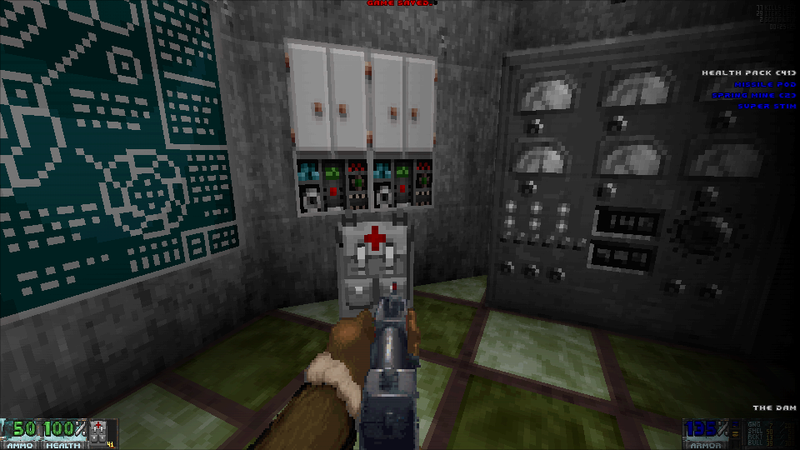 It’s also a remake of WolfenDOOM: Operation: Arctic Wolf by Laz Rojas. Operation Sea Wolf can be downloaded here. All eight levels constitute a single mission, in which Juno Radcliffe, Winter Agent, is required to destroy the Sea Wolf — the stolen stealth submarine bearing the nuclear weapon, kill Jotun Admiral Revok, rescue Agent Lamprey, settle the score with the old rival Thea Skuld, and escape alive. 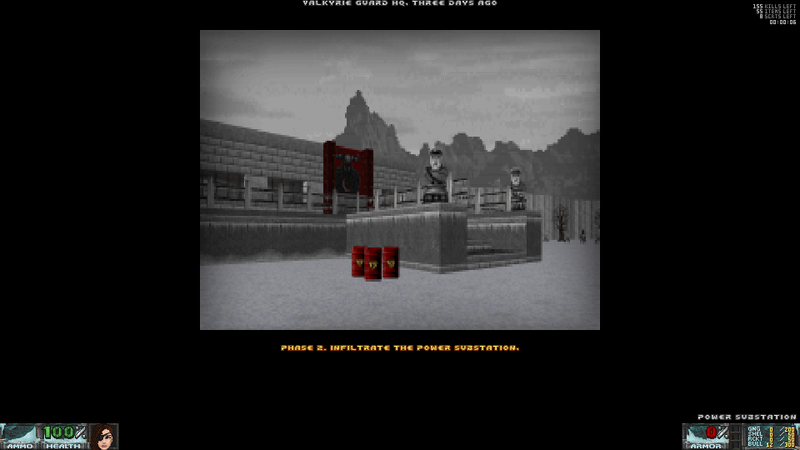 There is a short briefing-style slideshow intro for each level. For those who don’t like intros, they all are skippable. Skipping intros won’t leave the player confused or lost — all the levels are laid out in such a way that all the objectives described in the intros are solved naturally. These brief introductions tell the player the purpose of each level, who is the enemy, and what are the items to find and use. Levels are made in semi-realistic style. 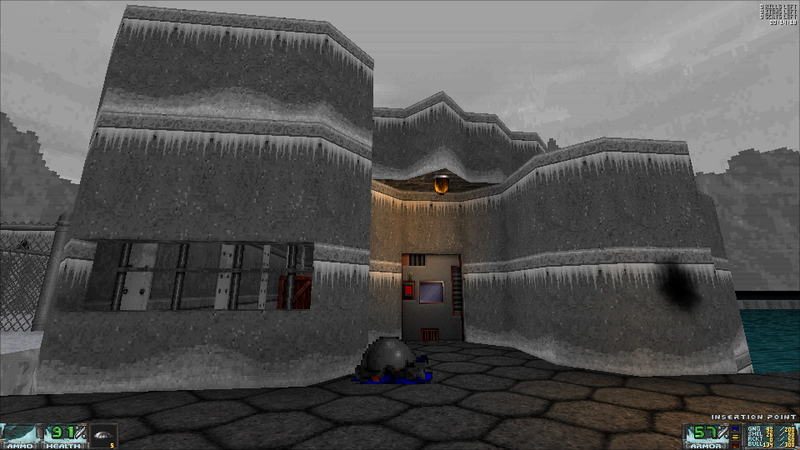 It’s a nice compromise between the abstract gameplay-oriented Doom level style and mundane realism. All the levels resemble real structures, like military installations, a dam, a bunker, and a submarine. The pacing is fast, and the game flow is smooth. The theme is a somewhat futuristic dystopia, set in cold snowy winter. Levels contain cramped indoors locations, wide open outdoor spaces, and everything in between. Locations change one another pretty often, so they won’t bore the player. One of the highlights of Operation Sea Wolf, is, of course, underwater sections. 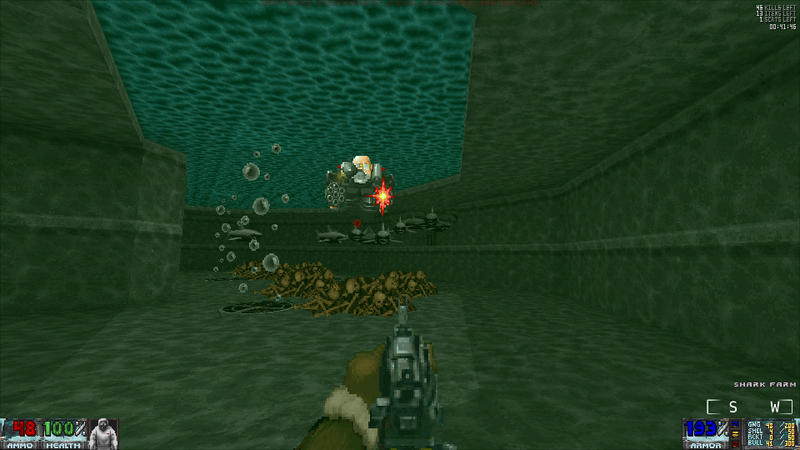 Here the player needs to keep track both of the Biosuit effect duration and of enemies, which are a special breed of sharks and harpoon marksmen. Underwater fights tend to be the tensest ones. And keep away from mines! Levels utilize a bunch of GZDoom features, like dynamic lights, a few voxel models, ambient sounds, and dynamic music. These effects are used sparingly, so the player is not overwhelmed with them. Dynamic lights are entirely optional, so the player won’t miss anything crucial by disabling them if they so desire. Audio effects help to create the atmosphere and the mood of Operation Sea Wolf. Detailing and sector lighting effects are always enough to provide the feel of the place, and never hinder the gameplay. Secrets in these levels are well-hidden but always hinted. They contain bonus supplies that won’t be unwanted especially for pistol starters. The weapon selection is close to the standard Doom 2 set but deviates from it in different interesting ways. There is a kick attack, Ballistic Knife, Raven M40 pistol, a pair of shotguns (Thunderhammer and weaker Scattergun), Gungnir rifle, Mjolnir Rocket Launcher, Mako Gauss Cannon, and Nord Harpoon Cannon. You start with a single Ballistic Knife and your trusty kicks. Kick attack is always available and will help in tough no-ammo situations. Kick attack comes in two types: as a standalone weapon, and a slower kick as an alternative fire mode for all the weapons. Ballistic Knife is one of the most interesting weapons in Operation Sea Wolf. It’s ranged (the knife blade is launched from the grip), it’s silent (enemies are not alerted), and it’s surprisingly powerful and therefore deadly. Shot blades can be picked up and used again, so with careful aim, the blades supply doesn’t diminish. Also, Ballistic Knives act as ammo for Nord Harpoon Cannon, which shoots them in rapid succession. Shotguns are shotguns: they are guns that shoot. Scattergun is only useful until Thunderhammer is found, which almost all the time happens pretty quickly. Gungnir rifle and Rocket Launcher are almost identical to the corresponding Doom weapons. Mako Gauss Cannon is powerful and pierces through enemies, but ammo is scarce, so keep an eye open for the gauss rods. Operation Sea Wolf also provides a variety of items that are essential for success. They are the Biosuit, portable Health Pack, Superstim, Spring Mines, and Missile Pod. Biosuit negates the damage from the freezing water and is required to pass through several underwater sections. Health Pack will help replenish health in dire situations. Superstim heals a little and provides temporary damage resistance. Spring Mines allow a tactical approach to the combat. A Spring Mine is set, it waits for the enemy, it goes boom. Missile Pod, a pod that launches seeking missiles, can take out several enemies in a different room. Learn how to place it properly, so the missiles don’t detonate too early. Maybe the weapon sprites aren’t the prettiest in the world, but they all have their personality, are well distinguishable and fulfill their role. A note on ammo: Operation Sea Wolf plays nicely both on continuous and pistol start (knife start in this case). If you prefer pistol starting the levels, better master effective use of Spring Mines and Ballistic Knife! Operation Sea Wolf features a wide variety of enemies. 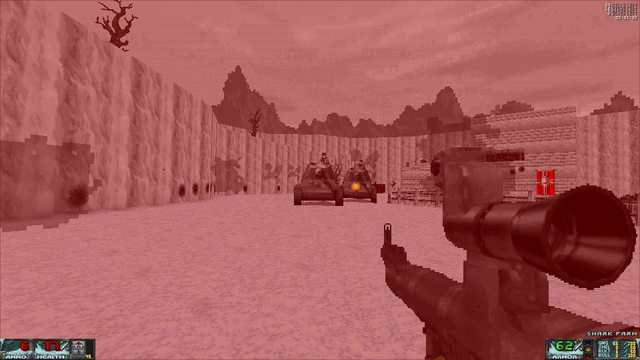 There are riflemen, shotgunners, menacing Einherjar soldiers, ferocious dogs, tanks, “medical” flying pods, soldiers with jetpacks, tough bosses and minibosses… This is enough to surprise the players and keep them on their toes. To overcome the enemy forces, the player often needs to learn their surroundings and arsenal. Enemies are distributed equally between males and females, and some of them have foul tongues. Everyone has bad manners. Fortunately for Juno, the acquaintance with most of the people in Operation Sea Wolf is brief and lethal (guess for whom). One notable feature is the presence of non-hostile workers. It’s nice to see people who don’t try to kill you once in a while. Should you play Operation Sea Wolf? Of course, yes. 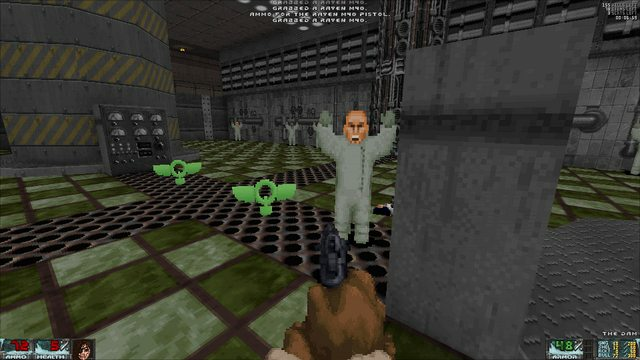 It’s an obvious must-play for Winter Agent Juno fans and a good choice for every Doom fan. This TC provides fresh dooming experience, at the same time not overwhelming the player with features and content. Operation Sea Wolf provides a few hours of action-adventure fun, and challenge for those who seek it. So, why not give it a try? 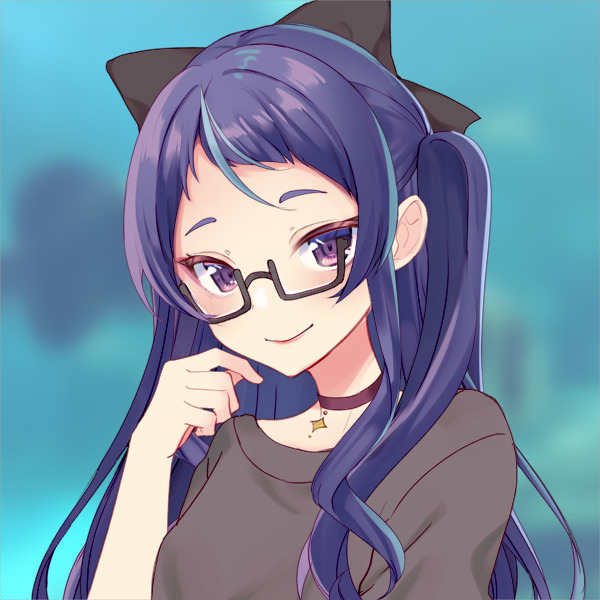 Good luck to you, Juno. Fight like an Amazon queen, and come back alive! Impie has been behind some of my favorite mods, this being no exception. This review is very thorough and really well done! This was a very good read indeed. Sea Wolf was definitely a breath of fresh air in a way that it also remade one of the oldest WolfenDoom mods out there and still feels like its own thing is a big plus in my books. Impie is definitely one of the most underrated modders in the community and needs more publicity with his amazing work. Though out of context: What other addons were used during your playthrough? I only recognize Target Spy and Weapon Menu, thanks. You don't need to quote an entire post with pictures to make a two word reply, so I've corrected the issue in your post.